Following the postponement of 2 of the 3 previously scheduled rounds due to unsuitable weather the Sunday League resumed at Chester-le-Street on June 7th with a good turnout of 15 teams from Tyne, Durham, Tees, Hexham, Talkin Tarn and Chester-le-Street Rowing Clubs. As Chester-le-Street don’t have stable boats it was the turn of DARC, along with Tyne RC, to provide the boats that are shared by all the participating crews. Clockwork precision enabled a speedy turnaround of trailer after Hexham Regatta the previous day to enable the event to get underway on time. This was to be the first sweep-oared round of the season. DARC entered 4 coxed fours including a women’s crew, DARC Green, making their debut appearance, who had instant success winning 2 races. DARC Demons (Margaret Richardson, Debbie Jahangiry, Gene Dobson and Maureen Miller) fared best on the day with 3 wins from 4 races. 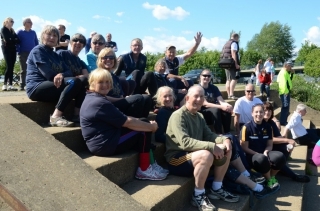 There were several close finishes in both Open and Women’s categories, raced over a 350 metre course, with competitors and spectators welcoming bright sunshine and the plentiful supply of cakes and bacon butties provided by the host club. After 2 rounds, Up Tyne Funk (TYN) lead the way in the Open competition with an unbeaten record of 8 points, followed by Darc Desperados with 5 points. In the Women’s competition Tyneapple Chunks (TYN) also have a 100% record with 6 points and are followed by 3 teams on 3 points – Darc Demons (DUR), Hexys Midnight Rowers (HEX) and Great Hexpectations (HEX). The next round takes place at Hexham in July. This entry was posted in Racing News on June 8, 2015 by Colin Lawson.